Bangladesh's batsman Sabbir Rahman (centre) reacts after his dismissal by South Africa's bowler Kagiso Rabada during the second day of their second Test match in Bloemfontein on October 7, 2017. BLOEMFONTEIN (SOUTH AFRICA) - South Africa?s fast bowlers ripped into Bangladesh?s top-order batting as the home side continued their dominance on the second day of the second and final Test at Mangaung Oval on Saturday. Bangladesh were 61 for four at tea in reply to South Africa?s 573 for four declared. Kagiso Rabada made the first breakthrough, new ball partner Duanne Olivier took two wickets and Wayne Parnell struck with his second ball when he replaced Rabada. Hashim Amla and captain Faf du Plessis completed centuries before South Africa declared. Amla (132) and Du Plessis (135 not out) became the third and fourth centurions of the innings. They joined Dean Elgar and Aiden Markram, who made centuries on the first day. Amla?s 28th Test hundred took him past former captain Graeme Smith on South Africa?s all-time century-makers list, behind only Jacques Kallis, who made 45. The only previous occasion on which South Africa scored four centuries in an innings was against the West Indies in a high-scoring draw in St John?s in 2004/05. Du Plessis hit his seventh Test century ? his first in 19 innings going back to a day-night Test against Australia in Adelaide in November 2016. Both batsmen looked comfortable after rain delayed the start of play by 90 minutes. They reached their centuries off 113 and 147 balls respectively. Their fourth wicket partnership was worth 247. Soumya Sarkar was the first Bangladeshi to fall, going too far across his stumps in the seventh over to be bowled behind his legs by Rabada. Mominul Haque gloved a legside catch to wicketkeeper Quinton de Kock off Olivier before Bangladesh captain Mushfiqur Rahim fell to a sensational diving catch by Temba Bavuma at gully off Olivier. Bangladesh?s misery continued when Mahmudullah sparred at a lifting ball from Parnell and was caught behind. Opening batsman Imrul Kayes survived the carnage and was 26 not out at tea. 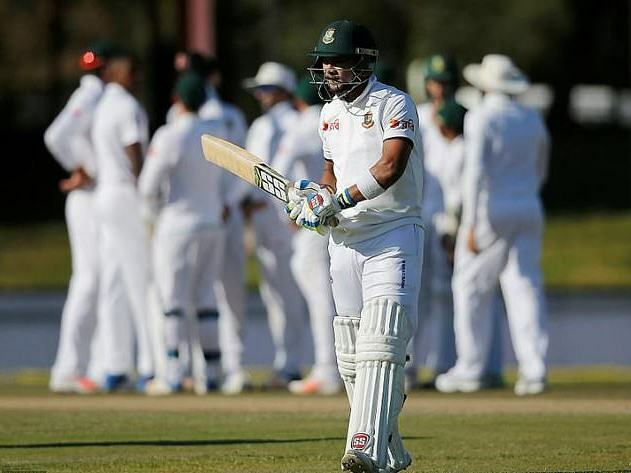 South Africa?s fast bowlers ripped into Bangladesh?s top-order batting as the home side continued their dominance on the second day of the second and final Test at Mangaung Oval on Saturday.